I do not yet have the actual new Chaos Daemon material in my hands, but I’m reviewing photos of the actual rules, so I feel pretty confident in beginning my review. As a side note, I finished the 2015 Independent Tournament Circuit (unofficially) as the 2nd best Chaos Daemon player. I guess that makes me the first loser, but I think it also qualifies me to write a little on this topic. I held honors all year until Pajama Pants made a final run at my placing at the Las Vegas Open. He is an excellent player, and he bested me fairly and he finished in the Top 8 while I went 3-3 and finished mid pack. I’ll continue to play Chaos Daemons, because they are my love, but I’m always looking for a new angle on the army. 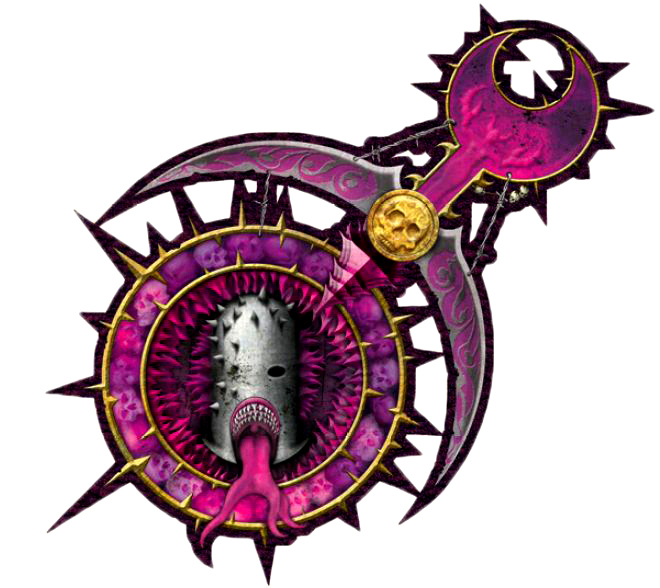 Something that has intrigued me for as many years as I’ve been playing Warhammer 40K is the idea of a mono-Slaanesh army. I’ve spent a few years collecting a large quantity of Juan Diaz models and am hoping that the new Daemon materials might breath some life into an otherwise mediocre sub-faction. I’ll start with the bane of every Chaos player – randomness. In order to play competitively, you need to minimize this. This has been done by every Chaos Daemon army since the 6E codex dropped through the inclusion of Kairos Fateweaver. Between his re-rolling the Warp Starm table results, and a single die re-roll per player turn to ensure effects like the Grimoire of True Names, failed grounding tests and crutch psychic tests, Kairos has earned his place in EVERY Daemon army. So, back to my mono-Slaanesh army. I’m going to endeavor to find a way to build the most competitive Slaanesh army possible. I hope to remove reliance on psykers and flying monstrous creatures. If I can do both of these things, then my only real concern is a failed Grimoire roll. Let’s set that concern aside for a bit and start at the beginning – Warp Storm. For this army I’m planning result 2, 4 & 9 are bad, 3 & 7 do nothing, and 5, 6, 8, 10, 12 & 12 are positive. In simple numbers, just over 55% of the results are good, and 22% each are bad or neutral. No wonder Fateweaver makes such a strong showing. Here is what it looks like with the new “Unearthly Power” rule in the new Daemonic Incursion Detachment. Unearthly Power – choose to add or subtract 1 to the result on the Warp Storm table. By adding or subtracting 1 from results that we don’t like, we can eliminate ALL bad results. 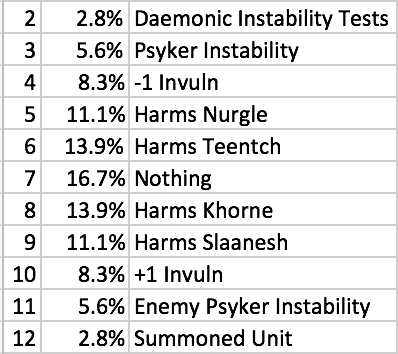 Since my list will hopefully have no psykers, almost 17% of the list is neutral and the remaining 83% is good. 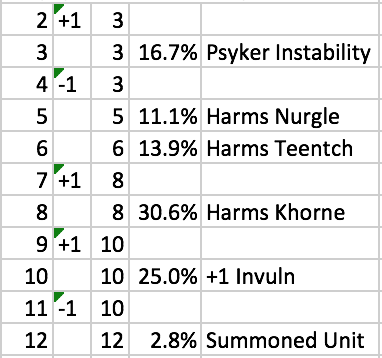 1 in 4 turns will give my entire army at 4++ unless my opponent has valuable psykers and I choose to let an 11 ride. The most likely outcome will be D6 S6 rending, ignores cover hits for each enemy unit that you roll a 6 for. This entry was posted in Gaming and tagged Chaos Daemons, Slaanesh, Tactics by Peter Kelly. Bookmark the permalink. I’m curious to hear your conclusions, I’m in the midst of my 4th mono God army (I have large khorne and nurgle armies, and I did about 3k of slaanesh stuff for a painting challenge awhile back, so tzeentch is my project this year). The new artifacts, formations, and warlord traits are going to take me awhile to wrap my head around! Being the collector sort that I am, my current plan is to go back to each of my armies and add enough to run all of the formations in the new book. The slaanesh seekers and chariots one is going to take me awhile but I’m definitely intrigued by the 6″ addition to run and flat out moves, gives khorne dogs a run for their money!